2x2mm - P-6 / O-6 / T-6 / E-5 / F-3 / DIN Security Level P-6 for information requiring extraordinary security. More Info. The HSM SECURIO P36 P-6 OMDD Shredder is a high performance Mobile Paper and Media Shredder designed to process the data security requirements for entire Departments. 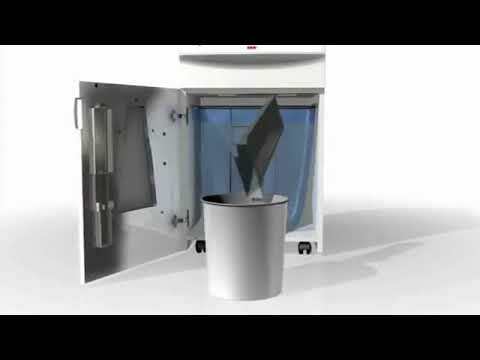 Depending on your security level required the HSM SECURIO P36 P-6 OMDD will shred up to 11 sheets of 80 gram A4 and A3 Paper Documents to 0.78x11mm high security crypto-cut pieces and the separate OMDD Media Cutter shreds CD’s/DVD’s/Bluray to the highest security 2x2mm pieces meeting European DIN O-6 requirements. All HSM Securio P36 models are supplied with a powerful 1800 watt motor which processes waste into the large 145 litre waste collection bin. Please note that this model has been given approval by the UK Centre for the Protection of National Infrastructure (CPNI), by meeting the CPNI Standard – Secure Destruction of Sensitive Items, and carries the CPNI Trademark. The SECURIO P36 Shredders, which have proved reliable even under the most strenuous load, features an intuitive multi-function operating system with automatic start stop and auto-reverse in the event of a paper jam making it very easy to use. Simply select the different operating functions with a single control and the powerful motor will shred your sensitive documents and media continuously. The quiet operating sound and attractive functional design means the SECURIO P36 will fit into any style of office without disturbing the operator. All Securio Shredders include a ‘Made in Germany’ construction design using the finest quality materials for safety and durability and further features a fully automatic oiling system of the cutting cylinders, a folding safety element with contact protection and integrated service flap, a full energy saving management system (EMCS) which has a sleep mode and automatic shutdown, and a fill level indicator inspection window where you can view the large removable, reusable waste bag. The HSM Securio Shredders are designed for longevity so rest assured as you are fully protected with HSM’s unique, extended Fully Comprehensive 3 Year Machine. All Securio models also feature ‘EcoSmart’ Technology which takes the low power energy consumptmart’ Technology which takes the low power energy consumption in standby mode to just 0.1 watt of electricity, whilst leaving the document shredder permanently ready for use at any time. Due to the EcoSmart’ Technology HSM have recently been awarded the prestigious, ‘THE BLUE ANGEL’ award, for enhanced energy efficiency therefore protecting our environment and climate. The use of a P-6 shredder such as the SECURIO P36 HS-5 + OMDD Cutter will aid your GDPR compliance.